HKT opens concept store HKT (SEHK: 6823) - HONG KONG, August 29, 2017 - HKT today celebrates the grand opening of its first "io.t by HKT" concept store, which showcases how the Internet of Things (IoT) technology enriches virtually every aspect of daily life. The store is located at ELEMENTS* shopping mall in Tsim Sha Tsui. Mr. Alex Arena, Group Managing Director of HKT, unveiled "io.t by HKT" to hundreds of guests and shoppers today. Mr. Arena said, "The concept store expresses HKT's brand new retailing notion of bringing top-notch IoT related products and services under one roof, as we enable our customers to embrace the benefits that IoT can bring to communications, entertainment, education, work, etc. In keeping with our 'Building for Tomorrow, Today' motto, HKT has been continuously investing in the telecommunications infrastructure in Hong Kong to meet our customers' present and future needs. This new store can demonstrate what can be achieved as technologies continue to move forward, and serves to inspire our customers to consider what the future holds, hence the store proposition of 'inspiring our tomorrow'." With a contemporary, stylish design, the 5,200-sq.ft concept store offers experience with advanced gadgets, live demonstrations, interactive displays, intelligent home designs and solutions. Signature products of the store are on display at the entrance. The shop comprises the following distinctive zones: Photo 9 Mobile Zone - The latest mobile smart devices and wearables are displayed in the Mobile Zone, along with a speed-test area where customers can sample the ultra-speed of Hong Kong's first 1Gbps mobile network by CSL. Besides, we will partner with technology institutes such as Cyberport to support local start-ups by displaying their innovations. 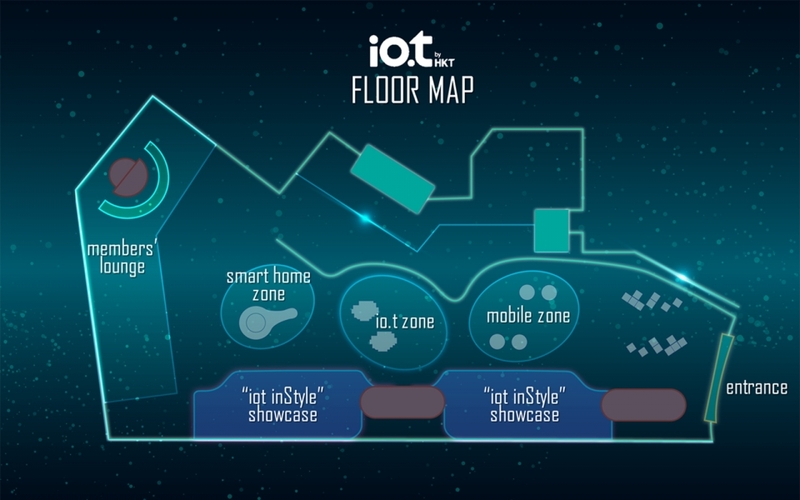 io.t Zone - A full range of IoT-enabled devices and solutions are showcased in this zone. A smart mobility area features live demos of connected car solutions and how driving information such as trip data and vehicle status can be collected and analyzed. On the nearby wall panel, customers will be able to select the latest Hollywood, local and Asian box office hits and popular music albums on interactive displays in a collaboration with HMV. "iot in Style" Showcases - These are HKT Premier's thematic showrooms of intelligent home styles. Renowned architects and interior designers are invited to combine their creativity and craftsmanship with IoT elements to design a series of stylish automated home. The first demonstration is a design setting of an AV room and a living room presented by Mr. Anthony Chan# . With our connected home control solutions, visitors may operate the shades, air-conditioning and AV systems using smart devices or voice control. An intelligent refrigerator with food management function is on display. Family members can connect by leaving messages on a touchscreen display on the fridge door, and can even watch videos on it. Smart Home Zone - This zone illustrates how the power and speed of NETVIGATOR 4x1000M Multi-User Broadband Service enhances the convenience for families, meeting different needs of family members, such as online gaming or OTT (over-the-top) viewing. Connecting with Smart Living's latest Wi-Fi mesh solution, the zone demonstrates seamless coverage of the entire home. We also introduce Smart Charge's one-stop EV charging solutions in this zone. Education tools for STEM learning, which inspire students to scientific and technological innovations for tomorrow, are exhibited. Members' Lounge - The Members' Lounge offers comfortable surroundings served by automated shades and lighting control. Visitors such as 1O1O and HKT Premier customers, platinum members of our loyalty program The Club, and invited guests are able to see for themselves how smart features make a restful environment all the more enjoyable, while feasting their eyes on panoramic harbor views. Visitors can also benefit from superb mobile network performance, as well as the PowerLocker self-service charging facility. Light refreshment will be provided. The Club will organize various events and workshops at the lounge in the near future. In addition to the designated zones, HKT and 1O1O are introducing a series of end-to-end retail solutions at the Members' Lounge and throughout the store, demonstrating how IoT, in-store analytics, AV and other digital solutions can help retailers transform their business in today's data-driven, digital world. "io.t by HKT" is designed by award-winning architect Mr. James Law. Its opening hours are 10am - 10pm on Monday to Sunday.